The Dong people are polytheistic and most of their religious beliefs revolve around animism. Animism is the spiritual belief that non-human entities, such as animals, plants, inanimate objects and natural phenomena, possess a spiritual essence. 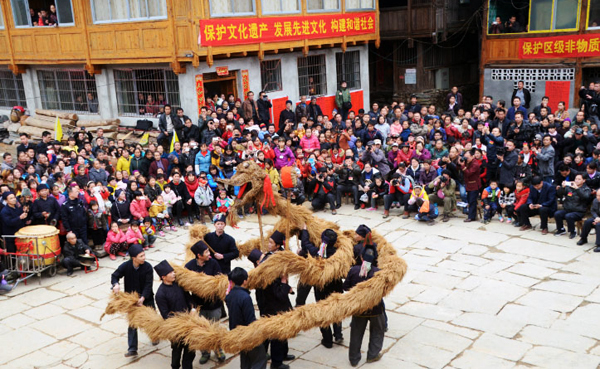 The Dong people also worship their ancestors and a few mythical shared ancestor figures such as Song Sang, Song En, Zhang Liang, and Zhang Mei. Dong deities tend to be based around buildings, natural elements or sacred natural phenomena, such as the two fire spirits, one of which is good and one of which is evil, the spirits of the sky and the earth, the bridge goddess, and the spirits of thunder and lightning. The most important deity in Dong mythology is known as Sa Sui and she is thought to be one of the original land goddesses. Other deities associated with more abstract concepts include the god who banishes evil, the love god, who consists of five male gods, and the family prosperity gods. Snakes are particularly important in Dong religion as they are believed to be the progenitors of their ancient ancestors. Dong people believe in religious totems, usually in the form of turtles, dragons or snakes, and in divination, using rice grains, bamboo roots, snails, and chicken bones for this purpose. 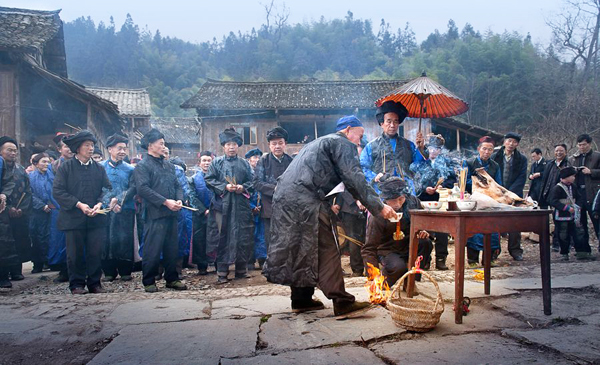 Other spiritual practices include: rituals, such as dragon dances and fire prevention ceremonies; sorcery, which is used to repel evil spirits, recover the soul of a disturbed child, exact revenge on enemies or induce someone to fall in love; and shamanism, which plays a predominantly holistic medicinal role. There are also many cultural taboos in Dong culture, many of which relate to pregnant women. For example, pregnant women should not participate in marriage ceremonies or arrangements, visit sick acquaintances, sacrifice to gods, or watch new houses being built. Unmarried Dong men should not eat pigs’ feet, as they have cleft hooves, metal should not be placed in coffins, as departed souls fear metal objects, and the lusheng should not be played between the sowing and transplanting of rice seedlings, as it may attract a plague of insects. These are but a few of many taboos that the Dong people adhere to.